How to cook a fresh pumpkin to use in recipes! In easy illustrated steps! 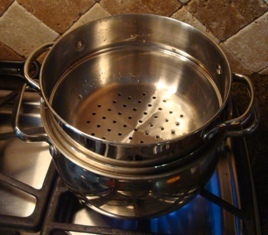 Stovetop steaming – Place your steaming basket or grid in the bottom of a large pot. Put enough water so it won't boil dry in 20 minutes, and yet is not so high that the pumpkin is touching the water level. You may need to add more water during the cooking. 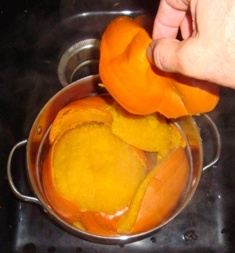 Add the pumpkin prepared in step 3, and get the steamer going. The cooking time is only between 8 and 12 minutes, depending on the range (gas or electric), and the pumpkin literally falls off the skin. Pressure cooker – Place your grid in the bottom of the pressure cooker. If your pressure cooker came with directions, follow those for pumpkin and/or winter squash, like butternut squash. If, like most people, you've long since lost the directions, try this: Add enough water to just touch the bottom of the grid or shelf that you will place the pumpkin on. Add the pumpkin prepared in step 3, put the lid with the gasket, the weight and anything else your cooker requires in place, and turn the heat on high. Once it starts hissing, turn it to medium or medium high. The cooking time should only be about 10 minutes, and the pumpkin should literally fall out of its skin. 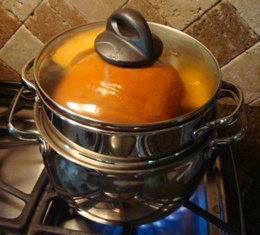 Oven – You can also bake the prepared pumpkin in the oven, just like a butternut squash. This method takes the longest. 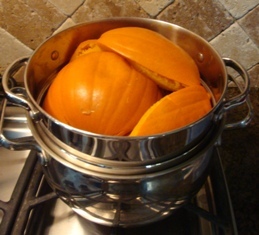 Just put the prepared pumpkin in an ovenproof container (with a lid), add about 3 cups of water to help prevent it from drying out and pop it in an 350 F (175 C) oven. It normally takes about 45 minutes to an hour; just test it periodically by sticking it with a fork to see if it is soft! A visitor writes on October 11, 2008: "I've always wanted to try cooking with actual pumpkins as opposed to the canned stuff. I did so today. It was a lot of work, granted, but everything I have made so far has been outstandingly delicious. Thank you for your tips, directions, guidance, and recipes! My freezer is full of pumpkin puree that's waiting for me to find another delicious pumpkin recipe!" This is the same type of standard canner that my grandmother used to make everything from pumpkinauce to jams and jellies to tomato and spaghetti sauce.